Price Drop! Was: $459.99 Now: $119.99. For a limited time only, while stocks last. Who has time to spend an hour or two at the gym or running around the neighborhood. If you are like the million of Americans who do not have this free time, you should try this Genki 360° 3D exercise machine with remote controller. Equipped with two 3D motors, this vibration machine can vibrate 360° with 120 adjustable speed levels. In addition to this, three vibration modes including walking, jogging and running give you similar effects as exercising outdoors. A convenient LCD screen monitors your time, mode and speed of your exercise. This vibration platform is suitable for people who are unable to spend time execising at the gym or can't go outside because of the rain. The silent mode of this vibration plate even allows you to get your exercise in without waking the neighbors or your own family. In addition, safety is no concern with the overload protection, anti-static and anti-slip systems. Made from ABS plastic painted in scratch-resistant piano paint, this vibration plate is good-looking and long-lasting. Included with the vibration platform are two sets of resistance bands, a remote control and a mat as an excellent bonus. Don't waste your time and money at the gym and keep fit at home! 31" x 15" x 6" approx. 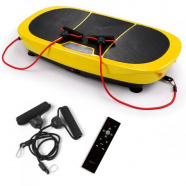 Vibration Plates, Remote Control & Balance Straps Included; Received product very quickly! So far I really like it, I am measuring and seeing if it truly does help! Easy to work out on! The instruction booklet does show a lot! Great product! Just received this Genki vibration machine today and I'm already in love with it! It's pretty heavy when you get the machine positioned. You can feel the burn, and when you are done you feel invigorated. Excited! Working out can be fun!